Use proper techniques when playing sports or exercising. Some college sports programs teach athletes how to reduce stress placed on the ACL. This involves a series of warm up exercises and jumping drills. 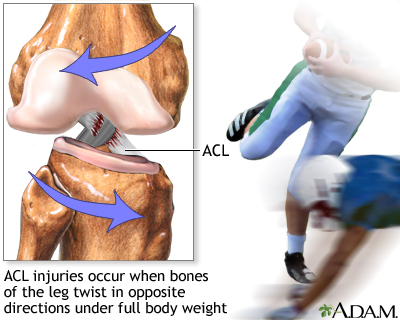 The use of knee braces during vigorous athletic activity (such as football) is controversial. 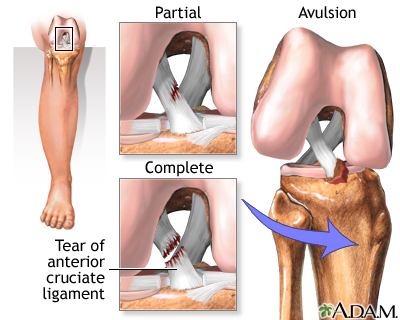 It has not been shown to reduce the number of knee injuries, but not specifically ACL injuries. Griffin L. The female athlete. In: Miller MD, Thompson SR, eds. DeLee and Drez's Orthopaedic Sports Medicine: Principles and Practice. 4th ed. Philadelphia, PA: Elsevier Saunders; 2015:chap 32. Nyland J, Mattocks A, Kibbe S, Kalloub A, Greene JW, Caborn DN. 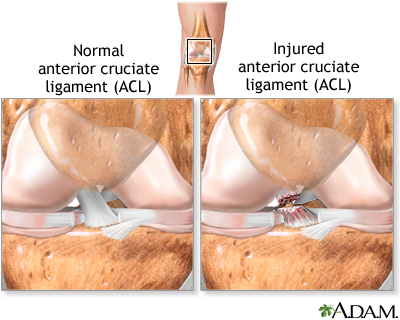 Anterior cruciate ligament reconstruction, rehabilitation, and return to play: 2015 update. Open Access J Sports Med. 2016;7:21-32. PMID: 26955296 www.ncbi.nlm.nih.gov/pubmed/26955296.